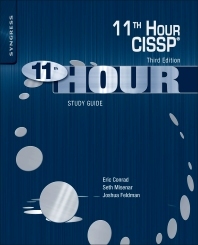 CISSP, GIAC GSE, GPEN, GCIH, GCIA, GCFA, GWAPT, GCWN, GSEC, Senior SANS instructor and Lead Consultant, Context Security, LLC. Joshua Feldman (CISSP), is currently employed by SAIC, Inc. He has been involved in the Department of Defense Information Systems Agency (DISA) Information Assurance Education, Training, and Awareness program since 2002, where he has contributed to a variety of DoD-wide Information Assurance and Cyber Security policies, specifically the 8500.2 and 8570 series. Joshua has taught more than a thousand DoD students through his "DoD IA Boot Camp" course. He is a subject matter expert for the Web-based DoD Information Assurance Awareness-yearly training of every DoD user is required as part of his or her security awareness curriculum. Also, he is a regular presenter and panel member at the annual Information Assurance Symposium hosted jointly by DISA and NSA. Before joining the support team at DoD/DISA, Joshua spent time as an IT security engineer at the Department of State's Bureau of Diplomatic Security. He got his start in the IT security field with NFR Security Software, a company that manufactures Intrusion Detection Systems. There, he worked as both a trainer and an engineer, implementing IDS technologies and instructing customers how in properly configuring them. Great last minute read before test to review everything. This book is worth as a quick reference on all domain topics. It is presented in an easy to understand manner to help your conceptual understanding of topics.